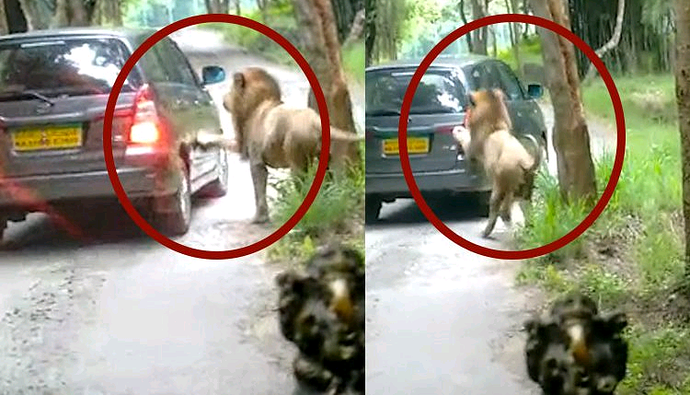 In a recent incident, a group of tourists who had hired a Toyota Innova in Bannerghatta Nationa Park were attacked by two Lions. This is not the first time that such an incident has happened, also the fact that Toyota Innova is a paid safari for people in the national park. In a series of incidents two lions crossed the path and one of them came ahead of the vehicle while the second lion tried to climb Innova trying to bite the rear windsheild. This left the tourists in a state of shock where, their cries could be heard from a distance. Usually such kind of reaction from the Lions is not triggered with Maruti Gypsy and Safari Bus. It seems like, the Lions did not like the new unfamiliar vehicle. Also the Director of Bannerghatta National Park blamed the negligience of the driver for the incident. As a result the driver was fired from his job. The negligience was due to the fact that the driver was supposed to stop the MUV when the Lions were approaching and they kept moving further aggrevating the animals. Also as a defensive strategy, the park authorities are wanting to send a proposal to the government to do away with the smaller vehicles and carry on with the Safari buses. Some safety concerns here include the fact that bigger vehicles can come with meshes but small vehicles liek Toyota Inniva find it difficult to install meshed on the small windscreens.